Ariana Miyamoto’s victory in the Miss Universe Japan contest has raised debates about race, representation, gender, and identity. While hāfu women are very visible in fashion and mass media in Japan, these women are rarely Blackanese. Recent events, like a blackface performance by Momoiro Clover Z and a call for apartheid, in Japan have reminded us that Japanese society has a long way to go in acknowledging and accepting the diversity of its population. Thus Ms Miyamoto’s victory gives hope that maybe, just maybe, things are changing in Japan. Mitzi Uehara Carter’s blogpost shares some important insights on these issues. 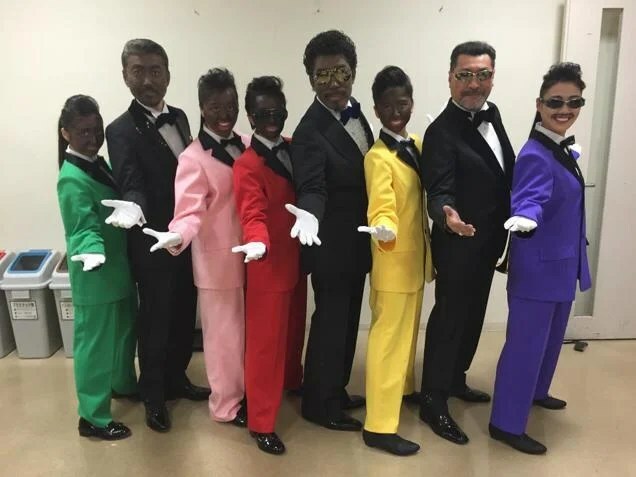 A quick post to note that blackface remains part of mainstream Japanese culture, as shown by the pictures of teen idol group Momoiro Clover posing in blackface. Despite the fact that the girls in the group are quite young, they seem to be going after an older demographic. First they record a song with KISS, and now they’re performing in blackface. Will their next single be a new version of “Mammy”? What does it say about race relations in Japan when in one week we have an op-ed in a major newspaper calling for a system of apartheid, and a teen girl group performs in blackface? It’s depressing that my post on blackface is as current now as it was four years ago. Please click the link below to read my 2011 post on blackface in Japan, and share your thoughts in the comments. 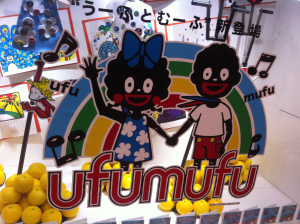 Blackface Continues in Japan. In 2015. In modern societies, we can observe that there are countless advertisements by mass media, companies, etc., in our daily life. It is almost impossible to not get influenced by them. Whether one recognizes it or not, one’s thought, common sense, standard of behavior, or actions are established based on these influences. Especially in the field of skin-lightening, mass media is playing an important role in idealizing the standard of beauty, according to which those who have lighter skin are more attractive and beautiful. The global market for skin lighteners is projected to reach US$19.8 billion by 2018, based on sales growth primarily in Asia, Africa and the Middle East (McDougall, 2013). In most advertisements of skin products in Asia, we can see the appearance of Caucasian and half-Asian models. As Japanese person, I was always wondering why even Asian companies use Caucasian or half-Asian models in order to promote their products in Asia. For skin care products, I assume that is to give an impression of light-skin beauty, according to which white is more attractive and superior to dark skin. An Asian ideal image of beauty is almost created and controlled as something really hard to achieve in order to create profit, and Asian women are following those images unconsciously. There is an argument about whether Asian women use skin-lightning products to become like Europeans. Joanne Rondilla, the author of “Filipinos and the Color Complex,” gave a different perspective, writing that many Asian women are satisfied with being Asian or having Asian features. However, they are looking to “clean up” or become “better” versions of themselves. The author repeatedly used the word “uniqueness” and “delicate” to describe Asian skin. 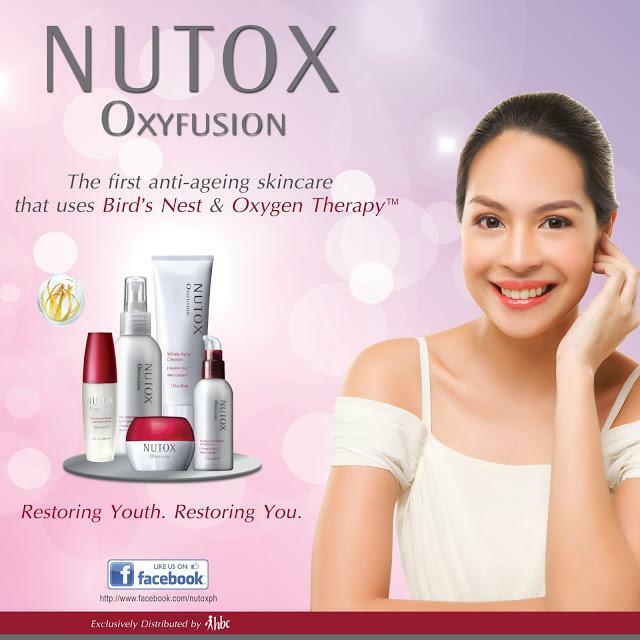 These words can be seen in many skin care products’ advertisements in my daily life. It triggers a question for me, what does uniqueness mean in this context? I feel like there is a contradiction between the Asian women’s desire of whiteness, which is the image of beauty companies are trying to sell, and their insistence on Asian beauty and the uniqueness of their skin. The assumption is the power. Many Asian women, including myself, have not thought about what they really want to be and what beauty means to them before purchasing the products. This is the natural consequence of every single person having a different skin tone, however, the models in skin care advertisements all seem to have the same white skin tone. The widespread phenomenon of the white standard has already become a huge pressure for Asian and other non-white women. I argue that every single person has their own way of beauty, regardless of race and skin color. Rondilla, L. J. 2009. Fillipinos and the Color Complex. Pp. 63-80 in Shades of difference: Why skin color matters, edited by Evelyn Nakano Glenn.Stanford, CA: Stanford University Press. In “Filipinos and the Color Complex,” the author Joanne Rondilla (2009) discusses the global skin-lightening market and how those products demonstrate the connection between skin color and beauty. She especially focuses on the Philippines, which has gone through multiple colonization by white people, and racial and skin hierarchy have been constructed. Rondilla argues that even though the standard of beauty in the Philippines is now inspired more by East Asian countries rather than Caucasians, the definition of beauty is still in accordance with white standards. On the one hand, non-white people tend to claim their uniqueness and originality in terms of their aesthetic values. That is, they have their own beauty standards compared to that of other parts of the world. On the other hand, in the era of globalization, it is practically impossible to ignore the influence of the global capitalism, products and ideas. There are so many products that are sold worldwide, and that implies the producers’ one message, such as, “lighter skin is better”. Even if the message is the same, the strategies can vary depending on the time and trends. Today, it seems that using images of mixed-race Asians is becoming an effective way of marketing in the Philippines and other Asian countries. Rondilla (2009) analyzes that mixed-race people are a “relatable ideal” (p. 71). That is, they can be identified as Asian, yet they have particular features that consumers might seek or wish to have. Thus, mixed-race people can share sameness and avoid Eurocentric aesthetic values while their features are “better” than others. Their commercial values lay on the Caucasian-like features and relatable aspects as Asians. 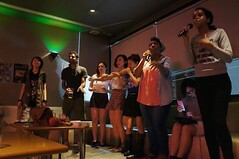 This mixed-race popularity can be seen in Japan as well. The term hāfu (half) refers to half-Japanese. In most cases, especially in the beauty industry, hāfu refers to people who are half-Caucasian. For example, some beauty magazines feature articles on “how to look like hāfu with makeup”. It always means how to look like someone who is half-Caucasian. What is different from the case of the Philippines is that half-Japanese models are not featured in advertisements of skin care products, while they are often in advertisements of makeup products. This could be because of the fact that Japanese people tend to think that they have their own skin color (Ashikari, 2005). This gap can stem from the colonization. The Philippines’ multiple experience of colonization makes the Philippines’ standard of beauty unique, and the so-called “color complex” there has been strongly constructed. With regard to the preference of lighter skin, Japan and the Philippines shared different historical backgrounds. However, in the era of globalization, it seems that these two countries are influenced by the white standard, although both claim their “uniqueness” and “Asian-ness”. Much like the way some people do not care about their local sports team, I do not give much thought to my racial identity. This is mostly due to the fact that if I gave my race anymore thought than the occasional ponder, I would be in a constant state of identity crisis. My mother is Japanese-Korean raised in Japan, and my Father is Irish-German-Mexican raised in America. Thus I have christened myself as an “Euro-Mexi-Asian-American”. Fortunately I have been privileged enough in life where I was never made particularly conscious of my race; I have never let my race define me and very few people I’ve met have defined me by it. However, due to recent events in Ferguson, Missouri, I have become unusually conscious of my ethnic background. After the grand jury failed to indict Darren Wilson my Facebook was splashed with statuses saying things like“f*ck white people #AmeriKKKa”, and articles talking about what white people need to do about racial inequality. There were many types of reactions to the grand jury’s decision but everything ultimately boiled down to race or more specifically, the oppression of black Americans by white Americans. Every day frustrated black (along with some enlightened white) Facebook friends posted lists of black victims of police brutality and offended white friends posted articles supporting the “not all whites” stance. Quite honestly, I didn’t understand my role in this conversation, I am horrified by the violence and inequality that American society has tolerated for so long but I cannot say that I completely empathize with black Americans. I am upset about Ferguson but I was not exactly sure why. It is this feeling of disconnect that had made me conscious of my ambiguous racial identity. On one hand I am partially white, does that put me on the side of the oppressor? Did I feel upset because of underlying guilt? But what about the times where I was discriminated against, what about all the times where people told me to go back to China? Was I upset because I was afraid of being a victim of violent discrimination? While it isn’t true, I couldn’t help but feel that there was really no place for me in the conversation about race, I straddled an awkward border of whiteness that made it seem that I didn’t have the right to talk about race as a minority. I thought about all these things for a while and ultimately decided that my disgust with the Ferguson case did not derive from any sense of ethnic identity (as a white or as a minority) but rather a betrayal of my national identity. As Craig Calhoun (1993:235) puts it, “The idea of nation is itself an instance and an archetype of this classifying logic of categorical identities”. As hackneyed as it sounds, I believed that being American stood for unparalleled equality and opportunity and seeing that it was not as I believed upset me quite a bit. I realized that my national identity was stronger than my racial identity because of my racial ambiguity. While this epiphany does virtually nothing to solve the racial tensions in Ferguson, I do believe that figuring something like this out can encourage more people to act as a community. Calhoun, C. 1993. Nationalism and Ethnicity. Annual Review of Sociology, 19, 211-239.